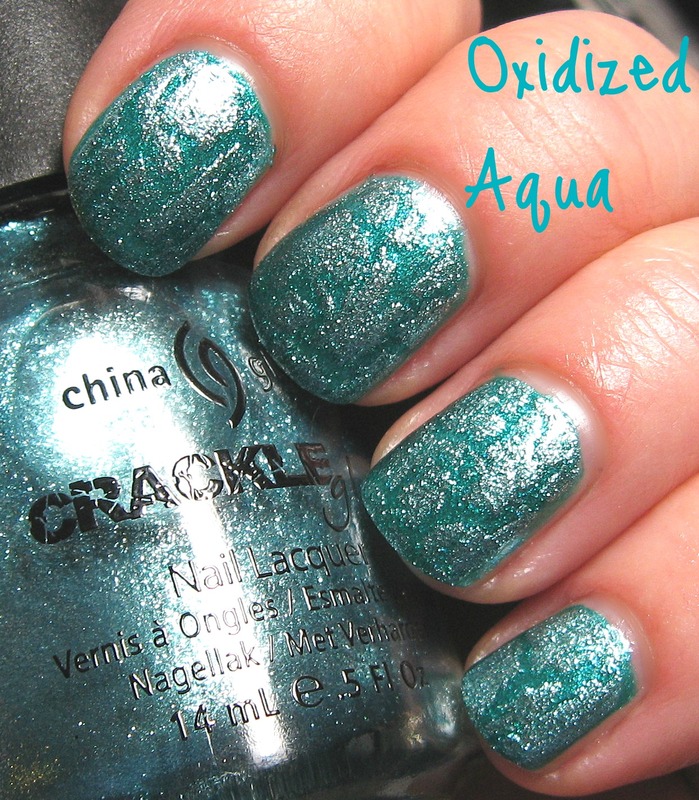 I have a couple more of the China Glaze Crackle Glaze Metals today, and I wanted to post a reminder that my June Monthly Contest ends tonight at midnight. One follower will receive the complete six piece China Glaze Crackle Glaze Metals Collection. Entry details can be found here. 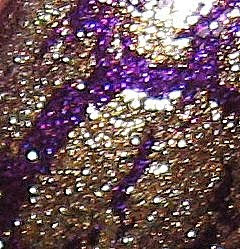 This is one coat of Tarnished Gold over Milani Purple Rush. 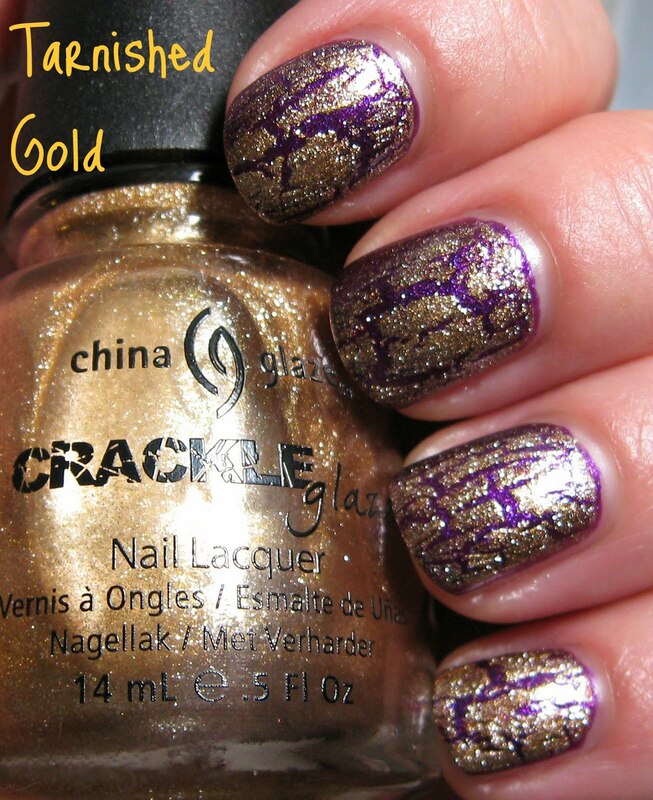 I love this combination--it's regal or royal looking in color, although I can't quite see Queen Elizabeth wearing crackle polish! This is a nice medium gold shade with plenty of metallic sparkle. 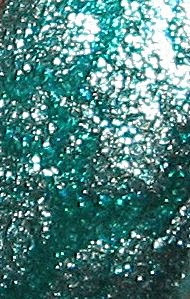 Oxidized Aqua is a pale silver/aqua shade that's shown here over Milani Racy Green. There's not a lot of contrast between these colors, but I rather like the toned down look. This collection of crackle polishes is appealing to me because the shades are a little more subtle with this type of formula than the cremes are. The formula is thin and applies easily, leaving a little more room for error than cremes do. I am finding that the colors are more faded or have less depth than they appear in the bottle, but with the exception of Tarnished Gold and Platinum Pieces, it's a unique range of shades. 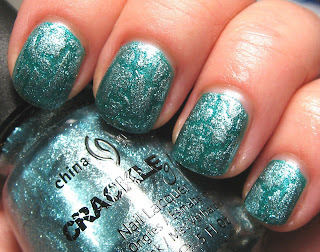 The crackle pattern emerges almost instantly, and it's a very consistent pattern. Ditto on the regal with the purple M. base to the gold. Nice gold on this one. these are nice color combos. Awesome! I'm loving it! Swing by my blog sometime! The gold/purple combo is just fabulous. 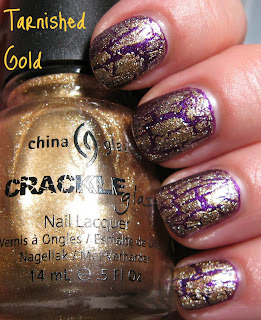 I NEED some of that gold crackle!!! 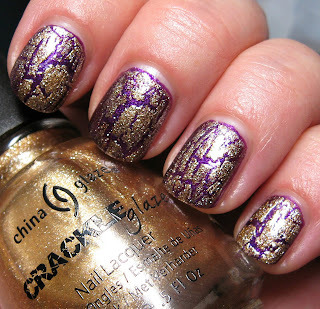 The gold and purple is amazing :) great pics!